Cup semi-final 1989: Hannaford passes the ball out. Referee Roger Quittenton and Richard Hill of Bath look on. Marcus Hannaford was a big combative scrum half who made 248 appearances for Gloucester, scoring 76 tries. He captained the club in 1987-88 and 1988-89, and played in the 1990 Pilkington Cup Final. Hannaford toured Italy with England B in 1986, scoring a try in his only B international. He was a member of the 1986 World Cup training squad and was unlucky not to gain senior international honours. Marcus Hannaford was born in Gloucester on 27 April 1963 and comes from the Hannaford family which produced former England, Bristol and Gloucester number 8 Charlie. Marcus was educated at Widden School and played for Widden Old Boys, Longlevens and Old Cryptians before moving to Kingsholm. He had already gained selection for the England Under 18 squad. 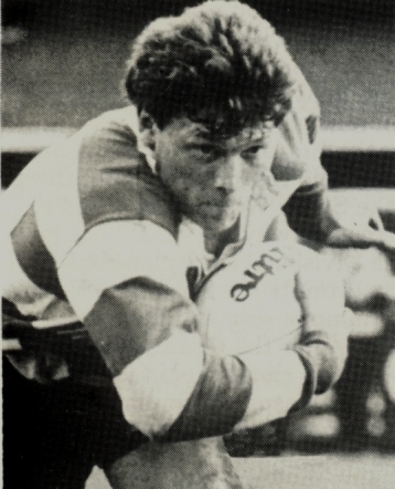 He joined Gloucester in 1983-84 and made his debut against Cheltenham on 21 March, but it was in the following season that he made the breakthrough, scoring 14 tries in his 38 games and forging a half back partnership with Mike Hamlin, which ranked with the great half back partnerships in Gloucester rugby history. He was already attracting notice and was selected as a replacement for England B v Italy on April 17. 1985-86 was an outstanding season for Gloucester, which they finished as John Smith Merit table champions. Among many good performances by Hannaford, a try in the last minute of injury time ensured that Gloucester beat Saracens 13-6 at Southgate to go into the quarter finals of the John Player Cup. He scored 13 tries in the season and was scrum half replacement for England Under 23 v Spain at Twickenham April 9. Hannaford toured Italy with England B that summer, scoring a try in a 27-14 victory over Italy B on May 7 1986. The Times said “The England management were pleased with the form of both their half backs” and in June 1986, he was chosen as one of the three scrum halves (the others were Nigel Melville and Richard Hill) in the 40 man World Cup training squad. In October he was due to attend a four day training camp in Portugal with the squad, when he severely tore the ligaments around his right knee while playing for Gloucester at Newport. The injury limited his appearances for the remainder of that season and put him out of World Cup contention. Marcus Hannaford was chosen as Gloucester captain in 1987-88, the inaugural season of the Courage Club Championship, winning his first league match in charge 39-3 against Coventry at Kingsholm on September 12. The Times said “Hannaford showed he is taking his responsibilities as captain with a dash of adventure………..(he) put his faith in running the ball at the opposition at almost every opportunity and his pack responded in rousing fashion.” Two weeks later Gloucester won 21-16 at Bristol in what The Times described as “A cracker of a game…… Hannaford, the Gloucester scrum half and captain, had an appetite and aggression that was decisive.” Although Gloucester failed to maintain this level, a 61-7 league victory over Sale in April, headlined in The Times as “Glory that is Gloucester”, ensured they finished third. Hannaford scored 15 tries in 34 games. Competition at scrum half in the South West was strong and although he made the South West squad Hannaford was not able to displace internationals Richard Hill of Bath and Richard Harding of Bristol. In 1988-89, his second season as captain, Gloucester started their league season with a 37-9 demolition of Moseley causing The Times to comment “speed is the essence of the Gloucester game.” Again this level of performance couldn’t quite be maintained but the club had another outstanding season. Gloucester finished second in the Courage Championship and reached the semi-final of the Pilkington Cup, although the gap between them and all-conquering Bath was obvious in a low-key cup semi-final at Kingsholm. Hannaford’s half back partner Mike Hamlin took over the captaincy in the 1989-90 season. Hannaford, who had so often been on the South and South West bench, was chosen to captain a strong South and South West B side which beat Cornwall at Exeter in October and was on the bench again for South and South West in the Divisional Championship. On February 3 he was a replacement for England B against France B. Hannaford was again a key part of a great team performance as Gloucester so nearly completed a Pilkington Cup and Courage Championship double, falling at the final hurdle in both cases. Although his appearances were reduced, he continued to play in the key matches in cup and league. In 1991-92 he featured strongly in a successful season in which Gloucester finished high in the league and he played in the epic cup semi-final at Kingsholm won by Bath in the last minutes of extra time. In November 1992 he suffered a fractured cheekbone due to a retaliatory punch thrown by a Saracens player and was side-lined for six weeks. The incident gained national notoriety when the BBC identified the wrong player on Rugby Special and had to issue a public apology. Hannaford returned to help Gloucester stave off relegation, controlling the deciding game, which Gloucester won 22-9 against Bristol at the Memorial Ground in a season when four clubs were relegated. 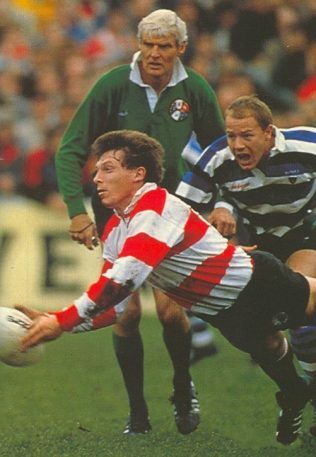 After playing a limited role in 1993-94, he returned to play in the last league game of the season at Kingsholm in 1994-95, a 28-17 defeat by Harlequins. Fittingly, it was also the final game for two other formidable competitors – Brian Moore and Mike Teague.